(15/P6) TRENTON – The Christie Administration, in partnership with the U.S. Army Corps of Engineers, today announced the award of a $38 million contract to reconstruct beaches, stormwater outfalls and implement modifications to existing groins in the area of Loch Arbour and Deal in Monmouth County. The contract, part of the Administration’s post-Sandy storm resiliency effort and part of the Sandy Hook to Barnegat Inlet Beach Erosion Control Project, was awarded to Seattle-based Manson Construction Company. Work is slated to begin in the spring. “With the contract award for this storm risk reduction project, we will now be able to complete the last remaining section for the 21 miles of shoreline between Sea Bright and Manasquan,” said Col. Paul Owen, commander, Army Corps of Engineers, New York District. The contract awarded this week calls for pumping about 1.4 million cubic yards of sand on 1.6 miles of beach in Elberon and Deal, along with modification to six existing stormwater outfalls and modification of two existing groins, which are coastal protect structures that extend from the beach into the ocean. The second contract includes beach fill, modification of existing outfalls and modification of an existing groin and is scheduled to be awarded in the summer of 2015. This will complete work on a 3.5-mile section of beach. The beach will be 100 feet wide. The restoration and repair work is funded 100 percent through the Army Corps’ Flood Control and Coastal Emergencies program. Construction is funded entirely by the federal government through the 2013 Disaster Relief Appropriations Act (PL113-2), commonly known as the Hurricane Sandy Relief Bill. Following the completion of initial construction, the project is eligible for continued periodic nourishment. The DEP has been working in partnership with the Army Corps to improve beaches and dune systems as part of the Christie Administration’s comprehensive resiliency strategy. 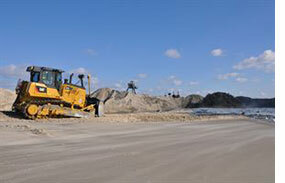 The DEP is working with the Army Corps on seven major coastal project areas. The Army Corps recently completed reconstruction of Oakwood Beach, along the Delaware River in Salem County, which was the second of the seven post-Sandy beach construction projects to be completed in the state. The seven projects were previously authorized by Congress, but not funded until the Sandy Relief Act was passed in 2013. In July, the reconstruction of the Raritan Bay shoreline in the Port Monmouth section of Middletown was completed. Contracts have been awarded by the USACE for beach construction projects from Great Egg Harbor to Townsend’s Inlet (Ocean City, Sea Isle and Upper Township) and Long Beach Island (Beach Haven, Long Beach Township, Ship Bottom and Surf City). Work for the Great Egg Harbor to Townsend’s Inlet project is anticipated to start in early 2015. Beach construction projects scheduled to commence in 2015 include work from Brigantine Inlet to Cape May Inlet (Margate and Longport); the Elberon to Deal and Deal to Loch Arbour projects, part of the Sandy Hook to Manasquan Inlet project; and the Northern Ocean County peninsula from Manasquan Inlet to Barnegat Inlet (Point Pleasant Beach, Bay Head, Mantoloking, Brick, Toms River, Lavallette, Seaside Heights, Seaside Park and Berkeley). Also in 2014, the Army Corps of Engineers completed eight post-Sandy beach repair projects, returning roughly 45 miles of previously engineered and constructed beaches along the New Jersey coast to their original protective construction design at a cost of $345 million. The Administration’s resiliency strategy also includes the Sandy Blue Acres buyout program, which will move 1,300 residential properties out of harm’s way, financing of projects that will bolster protections for water and wastewater infrastructure, establishing more protective reconstruction elevation standards in flood zones, and providing financial assistance for flood elevations of homes.